Cook the pasta and shells according to directions on the box. Cook the meat OR veggie crumbles in a pan on the stove on medium heat until done. With meat, drain the fat and return to the burner. Add 1/2 the packet of taco seasoning and stir. Add the speghetti sauce slowly until the meat or meat-like product is thick and sticky. You don't need to add all the sauce--save it to make more tacos later. Once the pasta is done and drained, add hot sauce to taste and toss it with the cilantro. Place the meat/veggie mixture in the taco shell, then add the spicy pasta. Top with a few jalapeño and you're done! 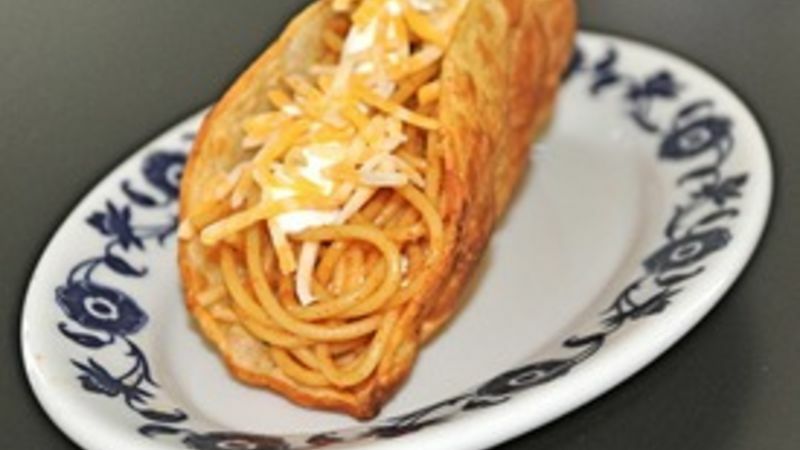 You heard it right, spaghetti tacos. The zany dish that originated on a popular teen series is actually quite tasty in real life. When you think about it, it makes sense that everyone’s two favorite weeknight meals, i.e., tacos and spaghetti, could come together to make one crazy-good dinner even adults can’t deny. The contrasting textures of tender spaghetti noodles and crunchy taco shells delights while the savory, well-seasoned meat is oh-so-satisfying. Technically, we’re not sure if this is Mexican spaghetti or Italian tacos. The only real question is, are you ready to make your kid’s dinner dreams come true?